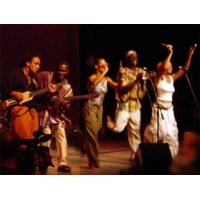 Baka Beyond is a world music group formed in 1992 with members from a wide variety of backgrounds and cultures, fusing Celtic and other western music styles with traditional Baka music from Cameroon. Baka Beyond began in 1992, when musicians Su Hart and Martin Cradick (formerly of the group Outback) travelled to south-east Cameroon to live with the Baka tribe in their natural rainforest environment. During their time there they recorded music with the Baka people, and some was later released on their return to the UK on Baka Beyond's first album, Spirit of the Forest. In the early days of the band, Baka Beyond consisted of English musicians trying to re-create the sound recorded with the Baka people and integrate it into their music, but it eventually grew to include musicians from Senegal, Brittany, Sierra Leone and Ghana. Martin Cradick and other members of the band travelled back to the rainforest to record music with the Baka people. They have recorded many albums containing a mix of music and sounds directly recorded from the rainforest, and music recorded by the band, which always shows a strong influence from Baka music.